Another all-electric compact car I was able to drive at the Oregon Museum of Science & Industry’s (OMSI) alternative-fuel vehicle showcase, Drive Revolution, was the 2012 Ford Focus hatchback. 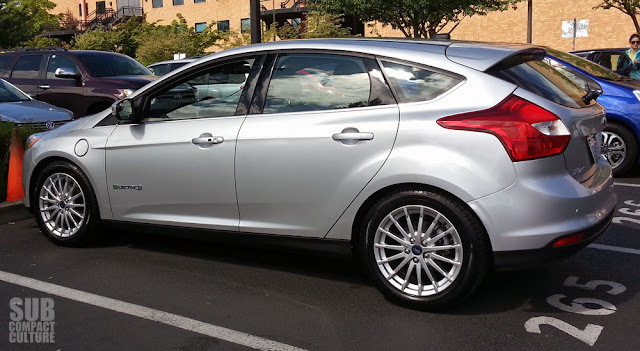 Even though the current model year for this vehicle is 2014, Ford brought the 2012 for this event. The Ingot Silver Metallic-wrapped exterior is just about identical to the conventional gas-drinking Ford Focus. 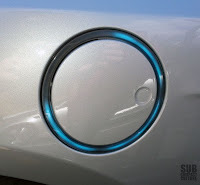 The only things different are the electric badging (note the playful take on the letter “E”, making it a two-prong plug that plugs the word “Electric” together), and the blue-colored LED “ring” on the front driver’s side fender. The ring is actually the cover and port where you plug your charge cord in. Flip the lid, plug it in. Easy as that. The colored part is pretty nifty: If the colored ring around the port cover is completely lit, than your vehicle is fully charged. If there is a section missing, your vehicle is not fully charged. It works like a clock, so if half of it is lit, then you should have half of a charge left. When your Focus is plugged in, the ring actually pulses. The exterior ring is just a tiny segment of cool technology in this ride. The interior has many modifications that can help you drive smartly and listen intently. This vehicle boasts Ford’s Sync with MyFord Touch, a Sony audio system, and multifunctional displays on either side of the speedometer. These displays show things like regenerative brake coaching, charge status indicator, driving efficiency monitor, the intelligent access with push button start, among other things. Also included is a digital screen that gives you visual clues as to how well you are driving your eco-car. For example, the more efficiently you drive, the more bright blue butterflies show up on the display. Gun it and the butterflies fly away. It makes you aware your range is depleting quickly, and if you want to keep your range up, you should drive a bit more conservatively. Another cool bit of technology: Ford created the MyFord Mobile smartphone app, which allows communication between the user and the car to monitor and control charging status, locate the vehicle on a map, and find the closest charging stations in the city you’re in. 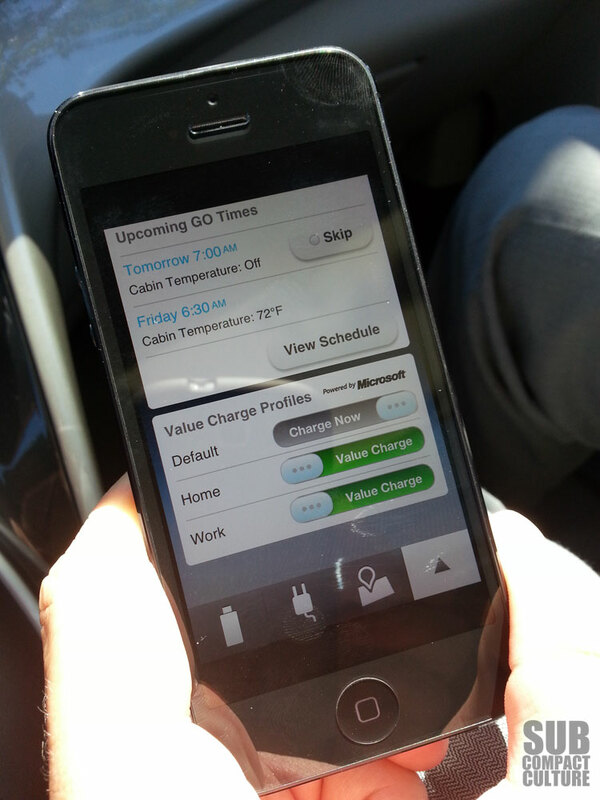 You can also remotely schedule the interior cabin to heat or cool at a certain time while it is plugged in. Pretty sweet, I say—you don’t start your day by getting into a sweltering car when it is 102 degrees outside. The Focus Electric has a lot of get-up-and-go. This 107 kW motor is mated to a single-speed transmission, and there's a lot of torque. So much so that you need to be careful when carving out quick corners. Again, the butterflies will say bye-bye if you lead-foot it, so keep that in mind. FYI, the range on this Focus is 76 miles on a full charge. This particular 2012 model was priced at a lofty $39,995. However, it was recently announced that the 2014 model would get a $4,000 price drop, making the vehicle $35,995. This is, of course, before any federal tax credits of up to $7,500 or state and/or local electric-car incentives. That will certainly drop the price down to a more attainable amount. The Ford Focus Electric is certainly worth a look if you’re looking for a smartly designed five-door EV that is “focused” on technology. Oh, and did I mention it doesn’t use any gas and it has butterflies?